Painter Jessica Stammen has discovered that her love of being and recreating in the outdoors dovetails perfectly with her vision for her art. ROCKPORT — Jessica Stammen paints her passion. 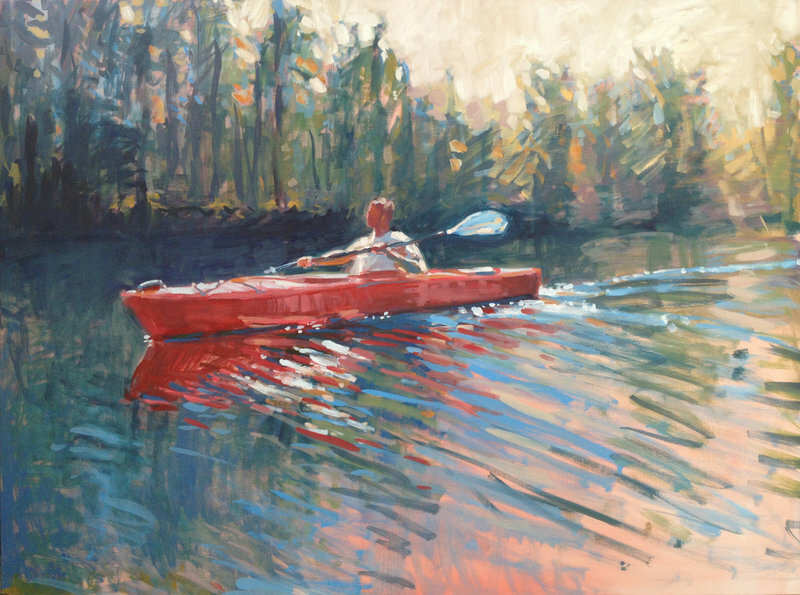 This month at Pascal Hall in Rockport, Stammen shows a collection of paintings that she has completed in recent years that involve her interest in and pursuit of outdoor adventures. 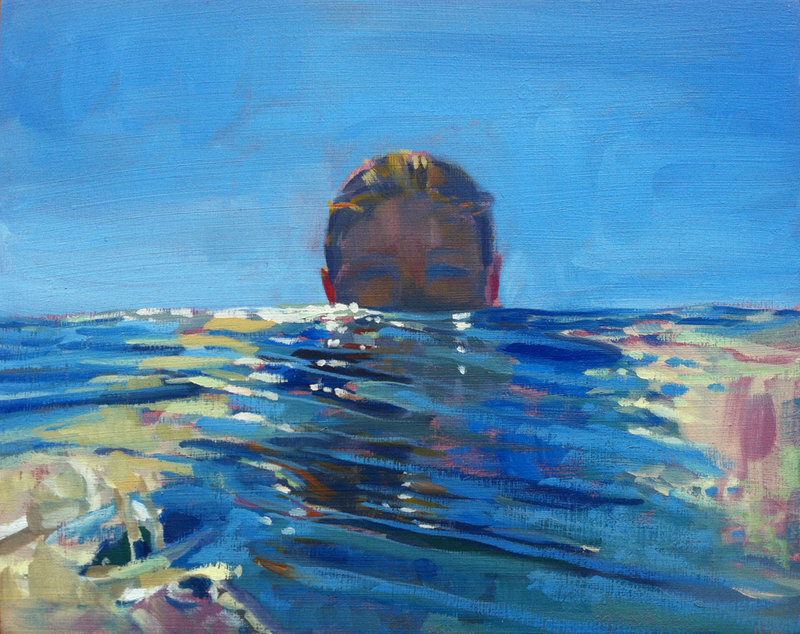 These are loose oil paintings of people swimming, kayaking, diving, rowing, surfing. There are paintings of people climbing rocks, playing pond hockey, fly-fishing, ice-fishing. “Something I’ve Always Known,” oil on panel by Jessica Stammen. “So Bright, the Morning Light on the Surface,” oil on panel by Jessica Stammen. “To Join the Others,” oil on panel by Jessica Stammen. 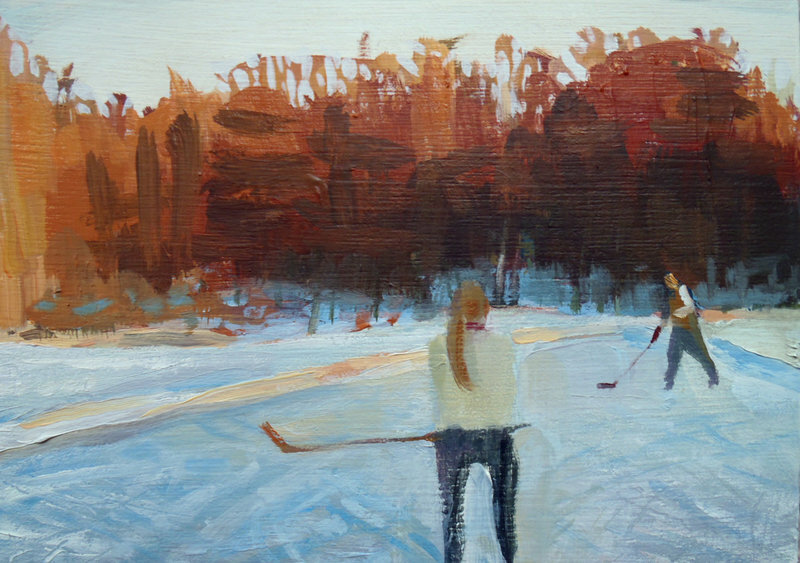 “Sunday Pond Hockey I,” oil on panel by Jessica Stammen. 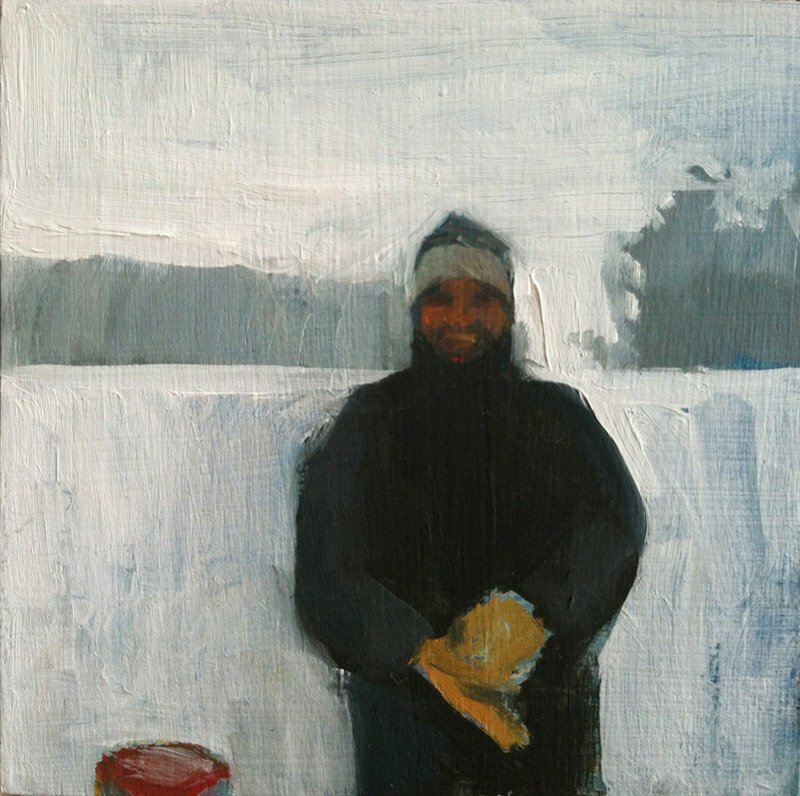 “Dad and His Mittens,” oil on panel by Jessica Stammen. There are images of docks, boats and buoys. Stammen, 32, is a dedicated outdoors person. She is a long-distance swimmer, and spends most of her summer in or on the water. In the winter, she is on the ice. She has taken up pond hockey in recent years, and finds herself enthralled by the sport. In many ways, Stammen has her work and play sorted out in a brilliant way. Painting is work — hard work, earned from years of practice — but it stems from her play time. Her play is her research. “A good balance of play in life is very, very important,” she said. Her attitude shows in the work. Many of these images, especially the water-level views of a swimmer dead ahead or a colleague in a rowing shell, were made after she took a series of photographs with a waterproof camera. She gives viewers the exact view that she has while she is moving through the water on one of her swims. She lives in Camden, and grew up on Megunticook Lake. 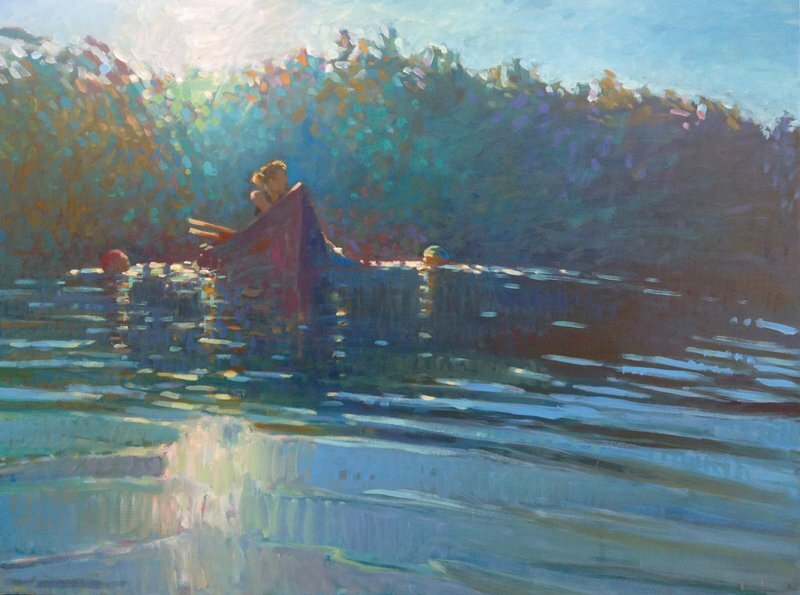 Her summers were spent on the lake, and many of the painting in this show are set on the lake and Megunticook River, which are between Lincolnville and Hope in the heart of midcoast Maine. She calls her exhibition “A Matter of Nature,” and she is showing with two other artists, David Warner and Susan Williams. Stammen’s art story begins in high school. She began painting as a freshman, and quickly developed an aptitude for it that was beyond her years or experience. Typically, she would spend her summers, as did her friends, washing dishes to make extra money. She propositioned her parents: Allow me to spend the summer painting, and I will sell my work at the teen art show. Her parents said yes, and Stammen upheld her end of the bargain. She spent a productive summer in the studio, and sold enough work to eclipse what she would have made as a dishwasher. Her career as an artist was under way. Stammen has always had a nose for work — and enterprise. 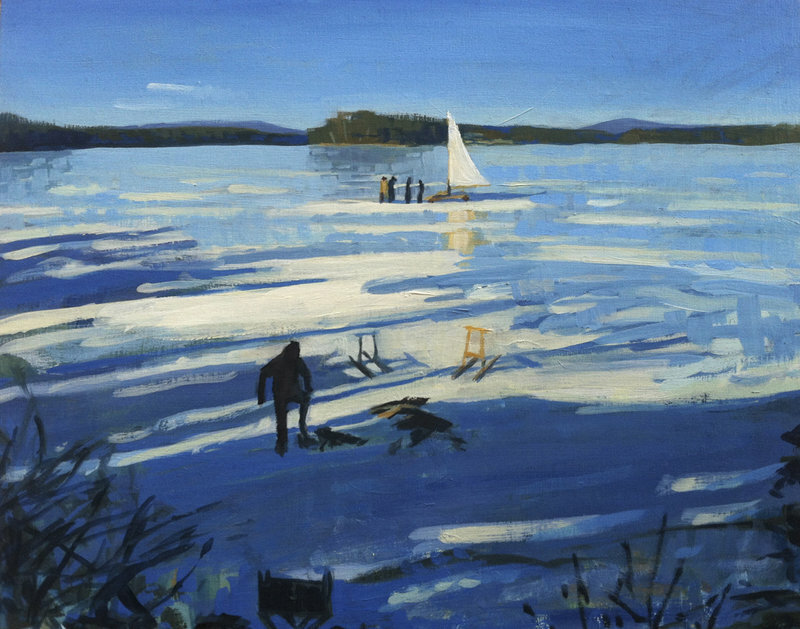 Each week on The Maine, an online community that reflects life in Maine in words and images, Stammen offers a 4-inch-by-4-inch oil on panel painting for auction, starting at $207. She calls it Tuesday 207, and it has proven an effective way to reach people who are interested in buying original, local art at modest prices. She received her bachelor’s degree from The Cooper Union in New York City, and earned a master’s from New York University in 2008. Stammen was in New York on Sept. 11, 2001. She was taking classes at Cooper Union, and working at St. Paul’s Chapel, the fieldstone church across from the World Trade Center. She was not there when the planes hit. In fact, she could not get back down there until a week later. When she did, she became an artist in residence. She designed a chalice from steel salvaged from Ground Zero. She documented the scene with photography. She made banners. She helped serve 3,000 meals a day, changed beds and attended church services with the first responders. She did a little of everything, and her world changed. “Tragic events can be the seeds of some of the most amazing, humbling, powerful and profound experiences that we can have, that then produce the greatest acts of creativity,” she said. She came home to Maine in 2007 while finishing up her thesis. Her mom was opening a store in Camden, and asked her daughter to help out. Stammen had work opportunities in New York, but decided to come home to Maine while sorting her options. She spent a lot of time the next few years looking out windows, painting the landscape. Finally, she conceded to her inner desires, and began painting what she loved doing, despite swearing to her professors and her parents a profound distaste for painting people. Nowadays, barely a painting goes by that does not have a human figure in it engaged in sport. She cites a quotation from Pablo Picasso as inspiration for her work. That Bible quote, she said, captures the mystery and immensity of the act of seeing. The act of seeing is something she learned from a mentor, the artist Alan Magee, for whom Stammen worked as a studio assistant beginning in 2006. Which is a fancy way of saying that Stammen likes to play. And hard. She believes her paintings are popular because people see themselves in them. Each of us might be that climber, that hockey play, that kayaker.